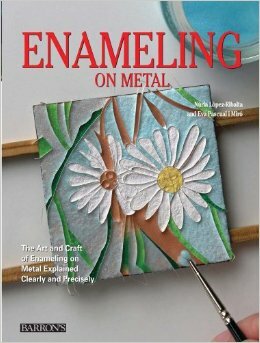 Enameling on metal is an ancient and revered art form, and this book presents detailed instruction that is suitable for self-teaching as well as for use in formal crafts classes. An opening chapter discusses and illustrates examples of enameled art objects created by medieval, renaissance, and modern masters. A chapter that follows shows and explains the materials, tools, and equipment that students of this craft will need--the special enamels and metal sheets, as well as mallets, files, brushes, metal-working tools, acids, abrasives, and the kiln for firing finished pieces. Subsequent chapters present detailed instruction in mastering various techniques that include pigment mixing, etching, engraving, painting, and firing. Students are introduced to several different enameling methods, such as cloisonné and basse taille. The book concludes with step-by-step instructions for a series of projects that students can carry out to produce a variety of beautiful enameled metal objects, including jewelry, wall hangings, decorative boxes, vases, urns, and sculptures. Hundreds of instructive color photos.